RIoT Control: Understanding and Managing Risks and the Internet of Things explains IoT risk in terms of project requirements, business needs, and system designs. Learn how the Internet of Things (IoT) is different from “Regular” Enterprise security, more intricate and more complex to understand and manage. Billions of internet-connected devices make for a chaotic system, prone to unexpected behaviors. Industries considering IoT technologies need guidance on IoT-ready security and risk management practices to ensure key management objectives like Financial and Market success, and Regulatory compliance. Understand the threats and vulnerabilities of the IoT, including endpoints, newly emerged forms of gateway, network connectivity, and cloud-based data centers. Gain insights as to which emerging techniques are best according to your specific IoT system, its risks, and organizational needs. 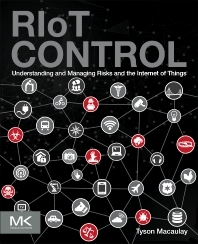 After a thorough introduction to the Iot, Riot Control explores dozens of IoT-specific risk management requirements, examines IoT-specific threats and finally provides risk management recommendations which are intended as applicable to a wide range of use-cases. Who Are the Major Players in the IoT? When Does the IoT Actually Get Here? Really—Who Wants to Know All This Requirements Stuff?! What Are the New Network Requirements? What Is Changing? Tyson Macaulay is a Chief Technology Officer and Chief Security Strategist with over 20 years in the security industry and experience at firms such as Fortinet, Intel and Bell Canada. Tyson is also a researcher with lectureship, books, periodical publications and patents dating from 1993. Tyson supports the development of engineering and security standards through the International Standards Organization (ISO), and Professional Engineers of Ontario. Specialties: Telecom-grade security design, Enterprise Risk Management, Technical Risk Management, Security Architecture, Security Methodology, Security Audit and Compliance, Security program development and Governance, International Standards development, Internet of Things (IoT), International Security Standards.